Police are questioning seven people after anti-terrorist officers raided a mosque in Finsbury Park, north London. Scotland Yard said the "intelligence-led" raid was linked to the discovery of the poison ricin in nearby Wood Green earlier this month. The cleric at the North London Central Mosque, radical preacher Sheikh Abu Hamza, insisted no link with terrorism would be found. The 0200 GMT raid involved helicopters, dozens of police vans and 150 officers - some using battering rams. Police continued to search the premises late on Monday morning, and could be seen removing computer equipment and bags of files. Of the seven men arrested, six were described as North African and aged between 23 and 48, and one as east European and aged 22. The men, said to be "residing" at the mosque, were arrested under the Terrorism Act 2000 and taken for questioning to a central London police station. Scotland Yard said intelligence suggested the mosque had been involved in recruiting terrorists, and in supporting terrorism in the UK and abroad. Officers were primarily looking for documents, computers and people, and no chemical substance had been found in the mosque, it said. Sheikh Abu Hamza, who was not arrested, claimed the raid was both part of a "war" against Muslims and retaliation for the stabbing of an officer during a raid in Manchester. "It is disgusting. 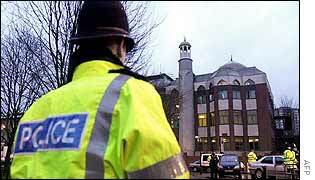 The police have never been denied access to the mosque," he said. "What can people have in a mosque? I think it was a provocative act. It was silly and illogical. "I am not a military person. I am not an institution. I am a preacher. "When did you last hear of a church being raided when someone has been arrested? These people do not have principles." Police insisted the raid was carried out sensitively, and said they had not entered parts of the mosque used for prayer, instead focusing on office and accommodation areas. They said they had "no quarrel" with ordinary worshippers at the mosque, and had been handing out leaflets suggesting alternative places of worship. But Deputy Assistant Commissioner Andy Trotter said: "Public safety is our number one requirement and we will go anywhere that we have to, in order to pursue those that pose a threat to this country." He said the raid had been highly successful, and he expected it to lead to "more action in the future" as "part of our absolutely determined effort to keep the country safe". BBC security correspondent Frank Gardner said: "It's part of this whole nationwide operation to try to wrap up this network of suspected Algerian militants here in Britain." Home Secretary David Blunkett said the operation had his "complete support". He said in a statement: "We must take firm action to investigate, and if necessary deal with, any potential threat to public safety without fear or favour." Sheikh Abu Hamza faces exclusion from the mosque because of "inflammatory and highly political" speeches at prayers. The Charity Commission wants him expelled as an agent of the North London Central Mosque trust, which runs the mosque, because of his "political" preaching. He has until late on Monday to answer complaints, but has said he would have to be "put in prison" before he stopped preaching. "It's part of an investigation linked to the discovery of ricin poison"
"We don't trust the police"
"The police have to act on the basis of information they have"
"This was a complex and carefully co-ordinated operation"